Starting in 1983 with 25 vinyl records and a half hour show on local radio, today there are three FM Cross Rhythms radio stations in UK cities; we support a group in Bethlehem who run an online radio station for Palestinian young people; there are weekly Cross Rhythms radio shows going out on more than 50 stations worldwide; a Media Training Centre raising up media missionaries and training local disadvantaged young people; and a Cross Rhythms website that is one of the busiest youth engaging sites in the UK, with more than 500,000 unique users every year. For over 30 years, Cross Rhythms has been pioneering media that will truly fulfill it's mission statement to ‘Impact Youth and the Wider Community For Good Through FM Radio, Training, Contemporary Christian Music and a Globally Influential Website’. But only with your partnership and support will these pioneering opportunities grow and flourish! Why not consider investing today into one of the unique Cross Rhythms media projects below, and join with us to help impact the lives of young people and those outside our church walls both in the UK and abroad. Reaching a youth generation through XRhythms. 61% of young people feel that adults are out of touch with their relationships; 46% believe that sexting, sending naked pictures of themselves, is part of everyday teenage life; 43% experience bullying at least once a week; 20% self-harm on a regular basis and 41% believe religion is more often the cause of evil in the world. Over decades in the UK, we have relaxed our Biblical morals, proclaimed as good that which is sin, and passed laws contrary to God’s word. And today the children are bearing the consequences. XRhythms will change the diet of what a youth generation is consuming through media! To offer them the antidote to what is making them sick. XRhythms is being developed this year and will be a brand new online Visual Radio station complete with it’s own dedicated website, YouTube channel, smartphone app, and specialist use of social media platforms like Instagram, Snapchat and Facebook, all aimed solely at the 13’s-20’s. Your support is needed to keep developing these new XRhythms media platforms - tools that are vital to engage a youth generation where they 'hang out'. Marketplace FM stations in Stoke-on-Trent, Plymouth and Teesside, with more to come. Since 2002 Cross Rhythms has pioneered FM community radio undergirded by Christian values. There are currently three Cross Rhythms FM radio stations in three UK cities, with the potential to role out more in the coming years. They do not sound like 'church on air'; they engage in the marketplace of our UK cities, building bridges between local church and the wider community, bringing kingdom influence into the influential sectors of local education, politics, entertainment, arts, health, media and business. Feedback shows they are heard in taxis, hairdressers, doctor's surgeries, petrol stations, dentists, building sites, bars, council offices and even Muslim owned shops and cafes. Your support is needed to help these stations continue to have impact in their cities; to market this incredible opportunity to churches in other UK cities and to help us plant new stations through kingdom partnerships. Raising up future media missionaries and training local disadvantaged youth. Launched in September 2012, the Cross Rhythms Media Training Centre is an Open College Network West Midlands accredited base to train, equip and disciple the next generation of 'media missionaries'. 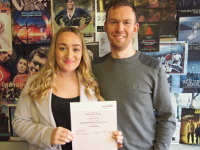 Young people from across the UK explore a 'call' to serve God in media, gaining accredited qualifications in a variety of media courses, as well as invaluable work experience in a live FM radio setting. In addition, training as Broadcast Assistants, Media Admin Assistants, in advertising and reception is offered to local disadvantaged young people in partnership with Babington College. Your support is needed to purchase additional equipment and to market the courses across the UK. Supporting local Christians with their online community radio station for local Arab Palestinian youth. For five years a Cross Rhythms supported radio show has been broadcast on an FM commercial station in Bethlehem, reaching not only that city but into Jerusalem, Jericho and parts of Jordan! Currently it is the most popular programme on that station - and more than 80% more popular than the next show - receiving feedback from both young Arabs and Jews on how much they like it! Following the endorsement of 11 Bethlehem church leaders Cross Rhythms was invited to help set up a 24 hour, online, local community radio station specifically for Arab Palestinian youth. This was launched at the end of 2015. Your support is needed to purchase additional studio equipment and to help sustain this station. So, which one of these amazing opportunities most resonates with your heart? Which one would you like to partner with and help see it grow in 2013? Simply follow these links to make either a One-Off Donation or to set up a Regular Donation, as a Friend of Cross Rhythms, where you will also be able to select exactly which project you would like your donation(s) to go towards!